Being a mother of two young boys is not easy. With a busy schedule and a lot of running around to do daily, I have to make sure my health is in order so that I can keep up with my toddlers without skipping a beat. 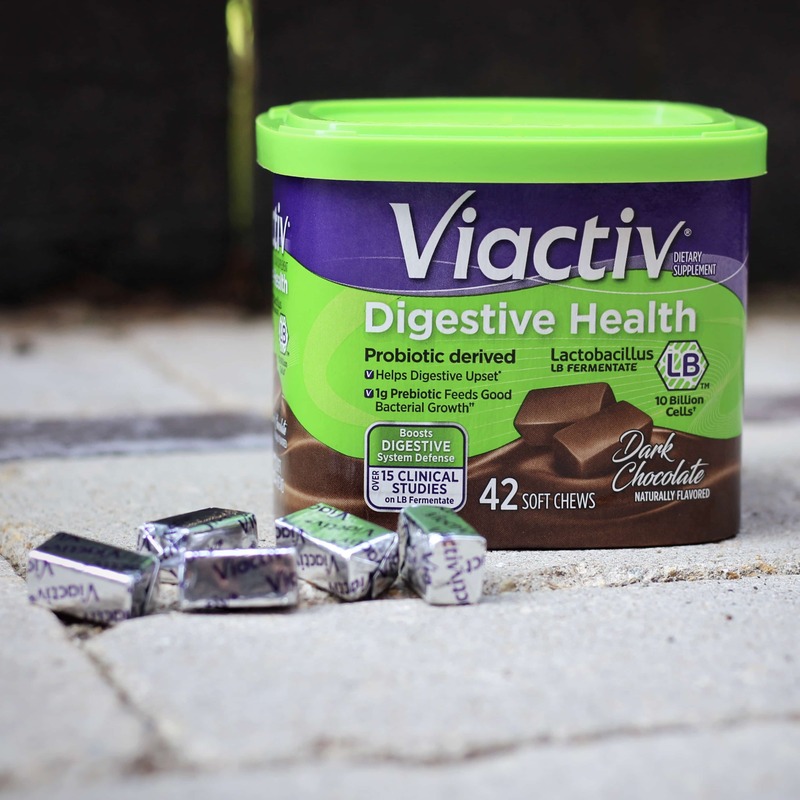 So to make sure I always feel my best, I started taking two Viactiv Digestive Health Chews every single day. They just came out recently and are so delicious! You can try them for yourself by ordering on Amazon or check your local Rite Aid. So, why is your gut health so important? Well, about 70% of our immune system is found in our gut, which is why taking care of your gut is so important. Our gut also helps regulate our mood and hormones. So, you want to make sure you’re getting enough of the “good” bacteria to help keep your gut in check. We usually think of bacteria and yeast as things that cause illnesses, but your body is full of bacteria- both good and bad. 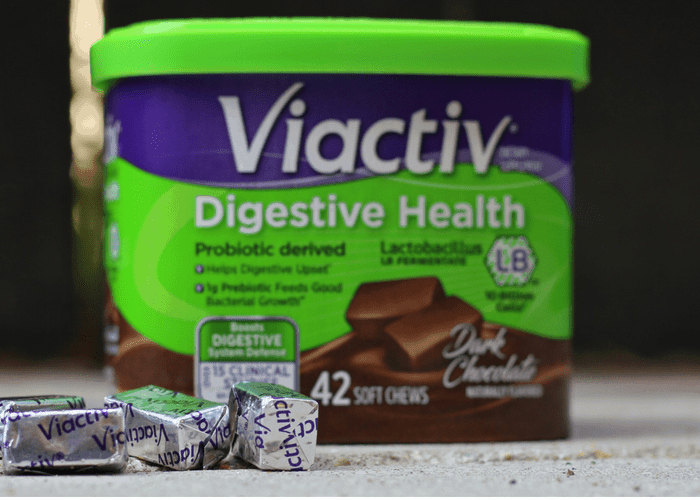 The prebiotic fiber included in Viactiv Digestive Health also works to feed good bacterial growth while 10 billion cells of heat-stabilized Lactobacillus bacteria fight the bad all in a daily dark chocolate chew. If there is an imbalance of bacteria in your gut, that simply means there is too much bad bacteria and not enough good bacteria. An imbalance can happen due to illness, medication such as antibiotics, a poor diet and more. Consequences of an imbalance can include digestive issues, allergies, mental health problems, obesity and more. Basically, any kind of imbalance does not feel good. And as a busy mom, you want to feel your best so you can keep up with your kids 24/7. Because, realistically, the better you feel the more energy and patience you have to care for your family and keep up with the day-to-day. Okay, so you know the importance of gut health for busy moms… but how do you fit this in to your already overwhelming schedule? For me, the easiest thing has been taking NEW Viactiv Digestive Health. You can easily order on Amazon or pickup them up at your local Rite Aid where they’re available. When I’m on the go I just keep them in my gym bag and/or diaper bag so I have them with me throughout the day. Then when I get a chocolate craving (let’s be honest, who doesn’t get them?! ), I just pop one in my mouth for a total of two daily. Talk about a win, win! So much easier than having to refrigerate a live probiotic and remember to take it. It’s an easy way to not feel guilty about getting your dark chocolate fix while helping digestive upset, promoting healthy gut bacteria and inhibiting the growth of bad bacteria… who can be mad at that?! Be sure to join Viactiv on Facebook for giveaways and exclusive offers and learn more about your gut health here. Disclaimer: This post was sponsored by Viactiv, but all opinions are 100% my own.